We select the best cocoa beans and ingredients from across the world, sourced from local, independent producers. All our products are created by hand in our workshop every day by our chocolatiers and pâtissiers. We prepare each order with care and enthusiasm, and are always there to help. 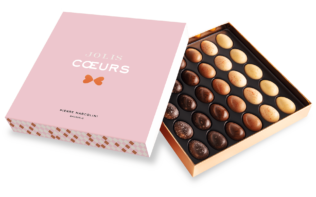 Whether you're giving them as a gift, treating yourself, seeking a little escapism or even some excitement, our chocolates will provide you with a rare and unexpected sense of emotion. 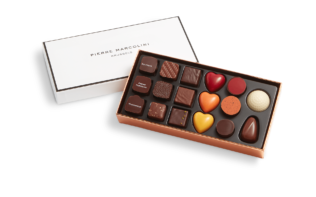 These flower infused ganaches of house chocolate are coupled with different fruit compotes and are brimming with smooth and fruity flavours. 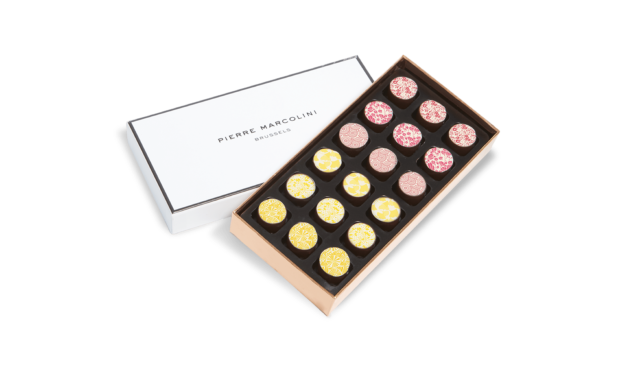 This season Pierre Marcolini has brought back flavours from exotic gardens in the East and South. The fragrance of jasmine, the scent of roses and the soft aromas of verbena are combined with the sun-drenched and powerful notes of citrus fruits. Sugar, cocoa beans, cream milk powder, cocoa butter, cream, glucose, dextrose, isomalt, yuzu pulp, raspberry pulp, bergamot pulp, passion fruit pulp, strawberry pulp, mandarin pulp, sorbitol, lemon pulp, pineapple pulp, lactose, Kalamansi vinegar, soy lecithin without GMO, gelling agent: pectin, citric acid, passion fruit vinegar, lemon vinegar, salt, natural vanilla, natural jasmine aroma, natural vervain aroma, natural orange blossom aroma, natural rose aroma, food colouring agents E171, E129, E100 and E102. E129 and E102 may have an adverse effect on activity and attention in children. 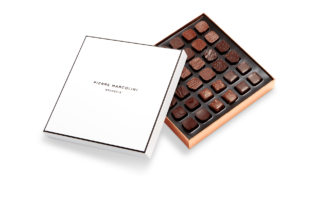 At Pierre Marcolini, it's not just about the cocoa beans. Whether it's Madagascan vanilla, Piedmont hazelnuts or Iranian pistachios, all our ingredients are meticulously selected from local producers all over the world. All our packages come with an attractive presentation bag so that you can give our creations as a gift. Be the first to hear the latest news from the Maison Pierre Marcolini. By subscribing to our newsletter, you agree to our confidentiality policy. View frequently asked questions and answers. Contact us with any queries about your order. Find your nearest Pierre Marcolini store.